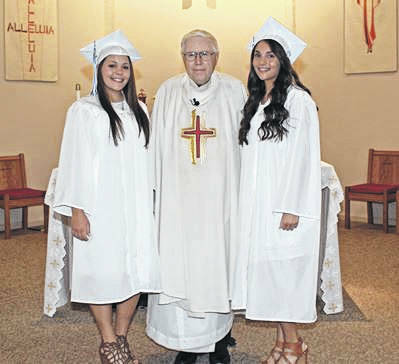 The Knights of Columbus Council 3335 awarded two $500 Scholarships to Kimberly and Mikayla Edelmann. The twin sisters are the daughters of Michael and Jennifer Edelmann. Both are graduates of Gallia Academy. The twins are also student athletes. Kimberly played for the softball team and Mikayla played for the tennis team. Both are good students. The scholarships are helping them as students at the University of Rio Grande, where Kimberly is studying Pre-Engineering and Computer Science and Mikayla is majoring in Early Childhood Education. The Knights of Columbus is the world’s largest Catholic lay organization. It provides members and their families with volunteer opportunities in service to the Church, their communities, and youth. With more than 1.8 million members in over 15,000 councils around the world, the Knights of Columbus annually donates more than $170 million and 70 million hours of service to charitable causes. The most prominent community activities of the St. Louis Council include the Coats for Kids campaign, Substance Abuse Awareness, and the Basketball Free Throw for developmentally disabled children and adults of the Rehabilitation Center. Please visit kofc.org and kofcohio.org for more information. All faithful Catholic men of the area are invited to join the Knights of Columbus (call Tyler Reynolds, the Grand Knight at 740-853-2511). Members enjoy great fellowship along with family activities and opportunities to serve the parish and the community. A big bonus is the life insurance program to protect families. It ranks at the very top as to financial stability among all insurance organizations and companies. Any profits do not go to stockholders, but rather are returned to the insured in rebates and used for a number of charitable causes.